A Gloversville committee is working on an ambitious plan for downtown revitalization, in anticipation of the relaunch of the $100 million Downtown Revitalization Initiative (DRI) competition for 2017. The committee has identified at least $22 million worth of projects it would like to see funded. Fulton County Center for Regional Growth President Ron Peters said he believes Gloversville came in second place in last year’s competition. To get a leg up on the next potential grant opportunity, the city hired a Downtown Development Specialist in December and formed a committee in March to work on the application. Oneonta and the 9 other cities chosen in 2016 – Glens Falls, Oswego, Geneva, Westbury, Middletown, Jamaica, Plattsburgh, Elmira and Jamestown – have been working since last summer on Strategic Implementation Plans for downtown projects that well exceed the $10 million available to each city over the next five years. The plans, due in June, outline ways to combine the DRI funds with other sources of private or public funds. Funding for another round of DRI was included in the state budget passed in the second week of April, but the announcement of the timeline for applications has not yet been made. CRG’s Peters said he suspects the turnaround time might be tight, and that Gloversville will be competing against many of last year’s runners up. The committee is keeping projects outlined in the 2016 application, such as streetscape improvements on South Main and Harrison streets, lawn improvements at Estee Commons near the bronze sculptures, a new bike path connecting downtown to Trail Station Park, a skate park at the corner of Bleecker and Church streets and a redesign of Castiglione Park. The Gloversville library, built in 1904 with funds donated by Andrew Carnegie, was the first public library to ever win CFA funding, receiving two $500,000 grants, as well as $214,252 from the NYS Public Library Construction program and $460,000 in private pledges and donations, according to its annual report. The library is currently operating from temporary space in the CRG headquarters and business incubator while the Beaux Arts building is completely renovated and restored. This past Saturday, March 25, 2017, kicked off the 2017 Downtown Events calendar in the City of Gloversville. The Cabin Fever Chili Cook-off & Brew featured nine area organizations and two breweries. Despite snowy weather, over 125 people came out to City National Commons to support Downtown Gloversville BID’s efforts to install the first micro-park in the Capital District this summer. The micro-park will be a creative, inviting addition to Downtown and will fit into a parking space on North Main Street, providing seating to anyone who wishes. “The atmosphere at the event was truly wonderful,” Melissa Hohenforst, president of Downtown Gloversville BID remarked. “Everyone that came through our doors were amazed and delighted to see the comradery in the community.” The event’s success was made possible by the generosity of the chili contestants: Gloversville Fire Department had the winning chili, second place went to Fulton County Coroner Margarette Luck, third place was shared by the Gloversville Police Department and Mayoral Candidate Bill Rowback. Other participating organizations included Mayor Dayton King, Downtown Gloversville BID, Fulton County Center for Regional Growth, Gloversville Public Library and Mohawk Harvest Cooperative. Upcoming events include the Spring Festival to be held on May 6th at the Farmers Market Pavilion. The event will mark the start of the Gloversville Farmers Market and focus on gardening. Free seedlings will be handed out by Fulton County Soil and Water, there will be an “ask the expert” for all of your gardening needs, music and more. The event is free and open to the community. June 10th will see the Third Annual Southern Adirondack Wine and Food Festival. This event will have over 25 vendors and feature area wineries, breweries and distilleries along with great food and amazing music. Ticket pricing and event details are available at https://www.southernadirondackwineandfoodfestival.com/. 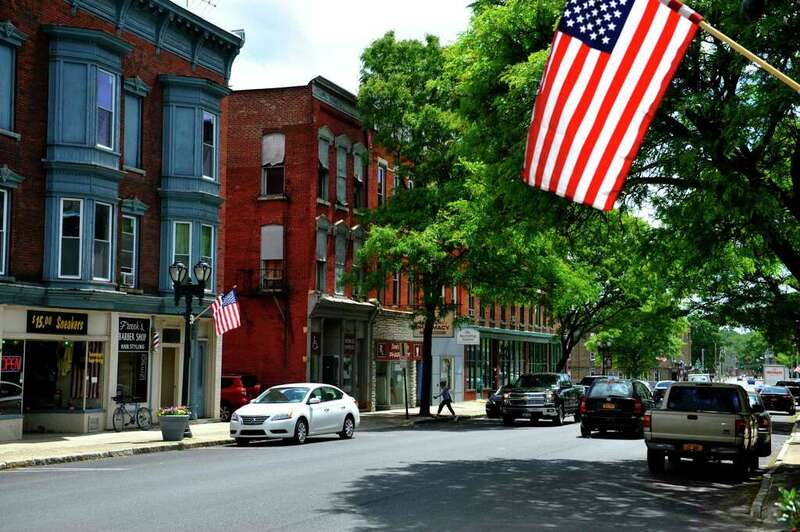 Downtown Gloversville Business Improvement District (BID) works with property owners, businesses, arts and cultural institutions, and others to revitalize downtown Gloversville. The BID is committed to providing a variety of services including research, technical assistance, event planning and advocacy. Businesses located in downtown range in size and scope, ensuring a consistently diverse and vibrant business climate. BID is an independent not-for-profit. To learn more, visit our website at www.gloversvillebid.com. Fulton County officials are eyeing improvements for downtown Johnstown and Gloversville as part of long-term economic development plans for the area. Both cities’ downtowns were identified in a survey of about 90 residents, elected officials and local business owners as key places to improve in the county’s quest to attract younger people. Once the center of the upstate New York leather industry, the area has in recent decades struggled to retain residents and businesses despite the comparatively low costs of living. The number of people directly and indirectly employed locally in the leather trades has dropped from 10,000 to 400 since 1970, according to the U.S. Department of Labor. Renovations to both downtown areas will require “local officials to look at how their infrastructure is arranged,” said Fulton County Administrative Officer Jon Stead. The downtown corridors of both towns, he said, were designed in the heyday of manufacturing and are now in many ways ill-equipped to accommodate the retail centers and business incubators that the county is trying to attract. “We’re trying to reorganize the downtowns for the modern era,” he said, noting downtown Saratoga Springs as an ideal balance between business, retail, parking and promenade space. The downtown focus is one part of the Vision 2026 and Jump Start Fulton County plans through which officials hope to market Fulton County as a cheaper alternative to the Capital Region. To bring more people in, Stead said, the county must also diversify its housing options for both millennials and older people — an issue that was routinely noted in the recent community survey. Officials are hoping to attract private investment to create equitable housing for both seniors and young workers. The median value of a Fulton County home from 2011-2015 was $108,000, compared to $208,000 in Albany County, according to the U.S. Census Bureau. The average monthly rents over the same period were $711 and $919, respectively. Stead said the county is in the process of extending water and sewer lines to areas that are ideal for housing and retail development. Economic development officials are also leaning heavily on attracting new businesses to a business park that inhabits the former Tryon Detention Center, on the borders of Perth and Johnstown. Vireo Health is using the park to grow medical marijuana but is so far the only occupant at the sprawling 515-acre site. Mohawk Harvest Cooperative Market is a vivid demonstration of the good that can happen when people of vision work together. To secure the downtown market’s front and center Main Street location, a group of private citizens purchased a building in a foreclosure auction and formed a corporation to act as landlord. The co-op’s rent is tied to its revenues, giving the nascent business the strength to grow, succeed and provide downtown Gloversville with a stable anchor store. What is on your wishlist for the next phase of Gloversville’s evolution? GLOVERSVILLE — At Chris Curro’s checkout counter, conversation was almost always on the menu. Whether it was talking about a new locally made product or the hidden costs to retailers from credit card transactions — the freshness of locally grown food from the Mohawk Valley Produce Auction or the importance of going corn-syrup free or fair trade versus free trade — it was always about more than just the sale. Since the Mohawk Valley Cooperative Market was first conceived in a small meeting of about 15 people at the First Presbyterian Church on West Fulton Street in 2009, Chris Curro has been its only general manager . Co-op Vice President Vince DeSantis was there when the market was formed and was part of the decision to hire Curro. Curro announced last week that Jan. 31 would be his last day as general manager for the co-op and that he was moving to another state to pursue a new opportunity. The Mohawk Valley Harvest Co-op has announced it has hired Sean Munk, an assistant manager at the store with a background that includes a degree from the Culinary Institute of America in Hyde Park. But Curro’s decision will affect more than just Mohawk Harvest. He served on the Center for Regional Growth’s board of directors and over the past seven years had become one of the leading voices in the movement to revitalize downtown Gloversville. DeSantis said it was originally Curro’s idea to move the co-op from its first location, a smaller store at 51 N. Main St., to the location of the former Open Window Gift Shop in the Schine building, which at that time had been acquired in a foreclosure auction by the Crossroads Incubator Corp. DeSantis said the relocation of Mohawk Harvest proved to the catalyst that motivated a collection of private citizens to purchase the Schine building for $70,000 and form a corporation called Schine Memorial Hall LLC, which acts as the landlord for the co-op, allowing its rent to be tied to its revenues. That has allowed it to grow and succeed, providing downtown Gloversville with a stable anchor store. Curro said he plans to move to Arizona, where a friend lives, and that he has big plans for when he gets there, but he won’t yet say what they are. He said he’s leaving for personal reasons and said he’s moved many times, living in places like Madison, Wisc., where he went to college, as well as California, and his decision to move to the Fulton County area in 2007 from Sioux Falls, S.D., was also due to personal reasons. “My wife, at the time, got a job here and my brother lived in the Saratoga-area, and I knew the area from having visited here several times. I knew it was a beautiful place, and I knew it had a lot of history,” he said. Curro said his professional and educational background before working at Mohawk Harvest was in teaching. He said he was a high school tutor working as part of grant-funded program at Centro Civico in Amsterdam when he randomly heard from a friend about a meeting in Gloversville to discuss the possibility of creating a food co-op market. Curro said he tried to take the principles he learned teaching advanced placement economics as a high school teacher and put them into practice in a retail store. He said the co-op started with about 100 members and a loan from a retired dairy farmer. After operating at its first location for almost two years, it moved to 30 N. Main St. in the Schine building, and the business grew tremendously. “We doubled our sales in the new spot and the next year we grew by 50 percent and then the next year we grew by 35 percent, so we continued to grow,” he said. Curro said he recalls many of the moments from the early years of the store, like moving all of the inventory of the former location in shopping carts, discovering 30 N. Main St. still had a hardwood floor under two layers of sub-flooring, and battling an early plumbing problem and trying to plug a leak with his finger. “I wanted to take what I had taught, economic theories, and put them into practice, but the real revelation was how economic theory meets human relationships because this store, like any good business, is really about the customers. If you don’t know them, if you don’t listen to them, if you don’t understand what they want and get to know them personally, it won’t work,” he said. “The co-op mission for us was local, healthy food with an orientation toward the community, because its community-owned and I took that vision to heart. Before we moved [out of 51 N. Main] our membership had doubled, which showed the community was supporting it, and we’ve since more than tripled that doubling, to about 625 members and the members represent about one-third of our customers. Last year, we had more than 19,000 transactions, so people are finding something of value here. Galinsky said the co-op recently had a membership drive over the summer and added 30 new members. He said co-op members have access to special discounts at different times of the year and if the co-op turns a profit, which he said it has a couple of times, it can issue a dividend to members. He said most of the store’s revenues have been channeled into growing its product lines with new equipment, products and employees. Curro said there’s more than $600,000 worth of equipment at the Mohawk Valley Harvest and he believes the co-op is poised for additional growth after his departure. Fulton County Center for Regional Growth President Ron Peters said he recruited Curro for a position on the CRG board after seeing Curro’s commitment to local products. Peters said Curro will be missed.